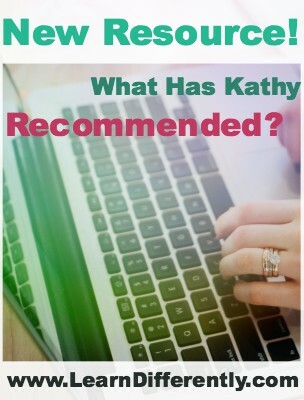 New Resource: What Has Kathy Recommended? by Kathy Kuhl On this site, I have reviewed over 100 books for parents of kids with learning challenges on this site. I’ve also suggested dozens of tools to help your child focus, read, and learn. This week we unveil a new resource for you: an updated list of all my recommended products, sorted by category and with links to my reviews. Until now, your only option has been to use the search window and start skimming posts to find recommendations. I try to make the reviews thorough and helpful because I know how little time you have. While reviews are important, this list will help you find what you need faster. FYI, I do not accept compensation for reviews. If I’ve been given a copy of a book to review (which rarely happens), I’ll say so in the review. Generally, I purchase books to review. My policy is not to review curricula. However, I have made a very few exceptions when something seems particularly suited to kids with learning disabilities and other challenges. Browsing through the categories in my new so-called “online store” will be faster and much easier than in my old one. The new version has a cleaner menu and more readable layout, plus a better range of categories to help you find what you need. Why do I say “so-called online store”? It’s more a carefully curated list of product recommendations than a store. Amazon has always processed, packed, and shipped orders made through this site. That hasn’t changed. You can use your Amazon Gift Cards, and Amazon will still handle returns and refunds. I still don’t have to pack boxes, and you don’t have to wait for me to run to the post office. I do receive a commission, however, at no cost to you. 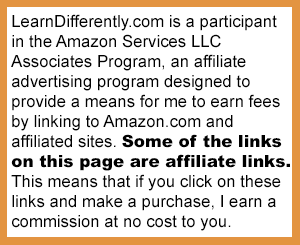 Though LearnDifferently focuses on helping kids with attention problems, learning disabilities, and/or giftedness, I recommend many great resources for all parents, all homeschoolers, and all educators. If you’ve got a favorite resource you think I should recommend, please send me a note or leave a comment below. Thank you.